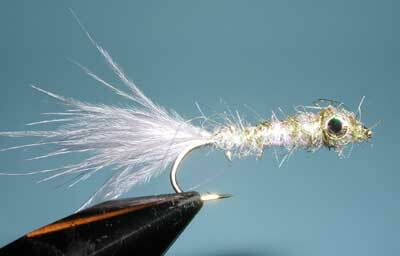 Notes: The Lite Brite minnow is a simple yet effective baitfish pattern. The marabou tail provides plenty of action and the Lite Brite body gives the flash that one would see with baitfish on the move. The use of the weight at the 3/4 position provides for some up and down action upon the retrieval. This streamer is usually used within small streams, pools, and pockets.